“New York is on its way, coming back stronger than ever before, rising to meet some of the biggest challenges in our history, remaining as a progressive beacon of light to the rest of the nation, and standing out as a model of effective government,” Governor Cuomo said. “Gone are the anti-business, obstructionist, tax capital, and gridlock mentalities, replaced with an entrepreneurial government that collaboratively works together for the people and partners with the private sector to create jobs and get the economy back on track,” he declared. To fund the Bank, a portion of Energy Efficiency Portfolio Standards, Renewable Portfolio Standards, and/or System Benefit Charge funds will be leveraged to attract private investment. The state will support new borrowing by the Green Bank to support loans for energy efficiency improvements. At the federal level, green bank models have been proposed but not yet adopted. But many states are beginning to create or explore green banks. Connecticut established the first green bank in the country in 2011. Called the Clean Energy Finance and Investment Authority, the bank borrows money and aggregates new and existing capital sources, and funds clean energy projects, including electric and natural gas vehicle infrastructure, electricity storage, renewable energy, and energy efficiency. Currently, various New York State entities collect and spend $1.4 billion per year on renewables and energy efficiency. Approximately 80 percent of this funding – or $1.15 billion – comes in the form of one-time subsidies. 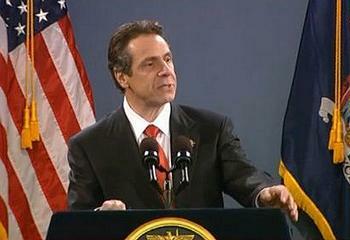 In spite of this level of spending, said Governor Cuomo, the state is far from realizing its clean energy goals. So while subsidies are important, it is becoming evident that they alone cannot achieve the level of clean energy deployment necessary, the governor said. “The NY Green Bank leverages private capital in a fashion that mitigates investment risk, catalyzes market activity and lowers borrowing costs, in turn bringing down the prices paid by consumer,” Cuomo said. “Through the use of bonding, loans and various credit enhancements (e.g., loan loss reserves and guarantees), a Green Bank is a fiscally practical option in a time of severe budget conditions,” he explained. Today, he said, New York State collects and spends approximately $1.4 billion annually on energy efficiency and renewable energy. New York is a member of the Regional Greenhouse Gas Initiative, which lowers carbon emissions through the use of a market-based cap-and-trade system. Among the benefits of such a bank, Cuomo says product awareness would be raised, contract processes standardized to reduce transaction costs, and informational deficiencies about loan performance for energy efficiency mitigated. Smaller green technology projects that individually may not be large enough to attract capital can be aggregated. Governor Cuomo also proposed to expand the NY-Sun Solar Jobs program at $150 million annually for 10 years to increase solar panel installations for homes and businesses. He proposed a Charge NY Program to invest in an electric car network to reduce reliance on fossil fuels by installing a statewide network of charging stations and providing charging infrastructure tax credits.